Khanorm is a town in Thailand. It is in the state/region of Nakhorn Sri Thammarat. The population is between 1000 and 2000. It is well known under the name of Khanorm-Mu Ko Thale Tai National Park, the park incorporates islands, mountains and coastal areas of Khanorm district and some parts of Surat Thani. Khanorm district is located in the north of the province Nakhorn Sri Thammarat. To the west is Surat Thani Province, while to the north and east is the Gulf of Thailand. It is undiscovered to foreign tourism. Almost of the population in Khanorm occupy themselves with fishing or agriculture (rice farming, rubber, coconut, fruits and nuts). It takes about 20 kilometers away lies the Don Sak pier with ferries for Koh Samui and Koh Pha Ngan. Nearby is also the Mu Ko Thale Tai National Park with trails, wildlife and more waterfalls. Khanorm is truly a place for relaxing, no nightclubs. It is truly paradise for holiday. Wat Kradangnga is an ancient temple of Khanorm that was probably built during the Ayutthaya period. Inside the convocation hall are exquisite murals of Lord Buddha’s life. There is also a magnificent Buddha image from the Ayutthaya period and interesting artifacts, particularly plates and bowls. Wat Thart Tha-Rarm or Wat Khao Thart is unique in that it has a pagoda made of coral located on Khao Thart (Thart Mountain). The entire pagoda is made of coral in the shape of an inverted jar. The pagoda is surrounded by Buddha images of red sandstone. Taled Bay is the first exotic place where visitors can see Pink Dolphins. 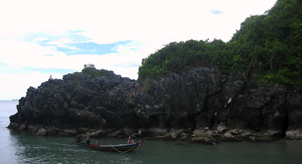 It is surrounded with famous islands such as Cave Island and Tarai Island. Kwang Phao Bay used to be the location of the old ferry port in the Khanorm district. However, visitors can find all the resorts and restaurants in this area. Na Dan Beach (Hat Na Dan) is a long, palm-fringed white beach. From this quiet beach, one can see the beautiful aquamarine water of the Gulf of Thailand. Khanorm Bay (Ao Khanorm) is the largest bay in Khanorm District. It is 1.5 kilometers from the district office and can be reached by taking Highway No. 4014, which separates from Highway No. 401, for 17 kilometers, then 1 kilometer past Khanorm Public Health Area Market, turn right and drive along Khanorm beach. 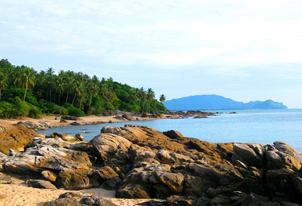 Nai Phlao Beach (Hat Nai Phlao) is Khanorm’s largest beach and the most popular tourist attraction. The beach curves along a mountain range. The overall scenery is one that features perfect nature, including a clean, white beach perfect for a day in the sun. Accommodation and restaurant facilities are also available. Dolphins at Khanorm there are both grey and pink dolphins (‘Sousa Chinensis’) frequently seen along the shoreline of Khanorm district, Nakhorn Sri Thammarat province. April to October is a good time for dolphin watching. Tham Khao Wang Thong it is where you can walk and crawl through the chambers. The cave has many large and small chambers, each with stalagmites and stalactites of odd sizes and shapes, like pagodas, dinosaurs, custard apples, and fried eggs. Khao Phlai Dam is a seaside mountain which borders Khanorm and Sichon. The Khao Phlai Dam Wildlife Development and Conservation Office are here in Tambon Thung Sai.